Today we travel through one of my personal favourites - the Central Otago district with its diverse and harsh landscape which is part of my old stomping ground. We rolled into the town of Roxburgh in time to see a horse and wagon procession through the main street - they are raising money for the Westpac Rescue Helicopter (an invaluable emergency service in New Zealand). After making a hasty donation from money rattling around in my pocket and a little pocket lint to go with it we set off in search of the fruit orchards. 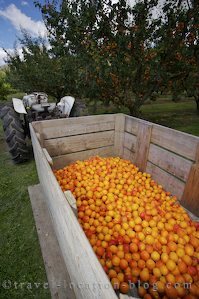 We pulled up outside an orchard where a couple of guys were harvesting tree ripened apricots using interesting and specially manufactured foot operated cranes which moved the pickers around the trees in jerky fashion. After gaining permission to photograph them in action, we were fascinated to watch the picking process including how they off load. Next is the town of Clyde on the Clutha River with it's quaint historic stone buildings. Clyde is also known for the Clyde Dam which was built in the 1980's and is the largest concrete gravity dam in New Zealand. We wend our way along the Cromwell Gorge, which contains a branch of Lake Dunstan created through the construction of the Clyde Dam, to the town of Cromwell with its massive fruit sculpture at the entrance to the town. Our plan is to reach the West Coast tonight so we high tail it from Cromwell and leave the Central Otago District, passing through the Haast Pass before reaching the rugged west coast. We stop briefly at a couple of viewpoints along the way namely Ship Creek (a lovely sandy beach littered with interesting driftwood) and Knights Point with stunning views of the Tasman Coast. We pull into the town of Fox Glacier and continue to Gillespies Beach after a brief stop in Fox to collect some info about a glacier tour for the following day. We pull into Gillespies Beach in time for a lovely sunset and even have enough time to build a couple of stone formations for photographing.